Teens have questions that parents don’t always feel equipped to deal with off the cuff. You already know not to lecture your teen, but it can be hard to reason with them when emotions run high, so where do you turn? 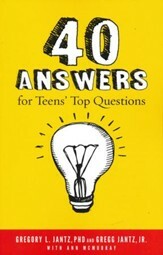 Dr. Greg Jantz, along with his teen son, offer easy-to-read, practical advice to effectively address 40 critical (and sometimes tough) topics, providing not just answers, but confidence and encouragement on issues from zits to puberty to faith! Enjoy having 52 weekly devotionals packed with engaging stories, hands-on activities, memory verses, and relevant discussion questions. 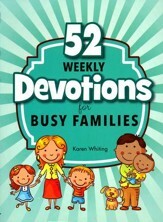 Flexibly designed for families on the go, the easy-to-read 52 Weekly Devotions for Busy Families is the perfect way to get your whole family together for fun and memorable moments while building a personal connection with God's Word. Have a blast learning more about each member of your family and draw closer to God than ever before! Perfect for family ministry, personal use, church giveaways, and more. 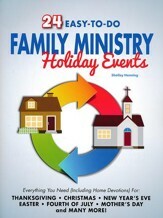 This new 24 Easy-To-Do Family Ministry Holiday Events book helps create events at church for families to come together once a month! Each event offers insight for the Children and Family Ministry team to encourage and support, while giving practical hands-on experiences and resources for families to carry on past the event. Includes take home materials to offer families an easy to use way of doing family devotions on their own, while reinforcing the learning. This is a great resource to help children's ministry leaders create opportunities for families to embrace their God given mission to be the spiritual teachers of their children. 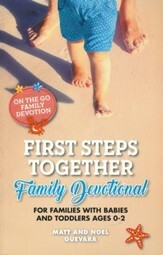 On The Go Family Devotions: First Steps Together serves as a roadmap for a parent’s spiritual journey with their baby or toddler. 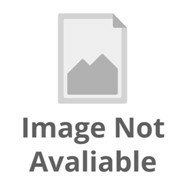 Best Beginnings removes the obstacles holding parents back from spiritually parenting their children by presenting 52 simple, structured devotionals. The peaceful tone and honest stories will create an atmosphere parents want to return to and continue. Parents will feel equipped and well cared for on their journey, as they develop a strong sense of confidence in their ability to guide their child to God and listen to the Holy Spirit. 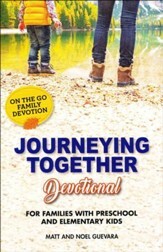 On The Go Family Devotions: Journeying Together takes the framework introduced in Deuteronomy 6 and applies to the daily life in the modern family. Each devotional gives parents ways to share their faith at home, on the road, when they wake up, and before they go to sleep. Each week, parents will engage in a devotion that centers them in Scripture and creates habits of engaging in casual conversations about God that will propel their child forward in their spiritual journey.